Being a museum professional I get a couple of questions all the time. The first being do you go to museums when you're not at work? Yes!! I probably spend way too much free time at other museums haha. The second question that a lot of people ask me is do I have any recommendations when it comes to visiting museums. Happy museuming! I feel like this is my go to number one tip for anything these days! You're definitely talking to a planner here. 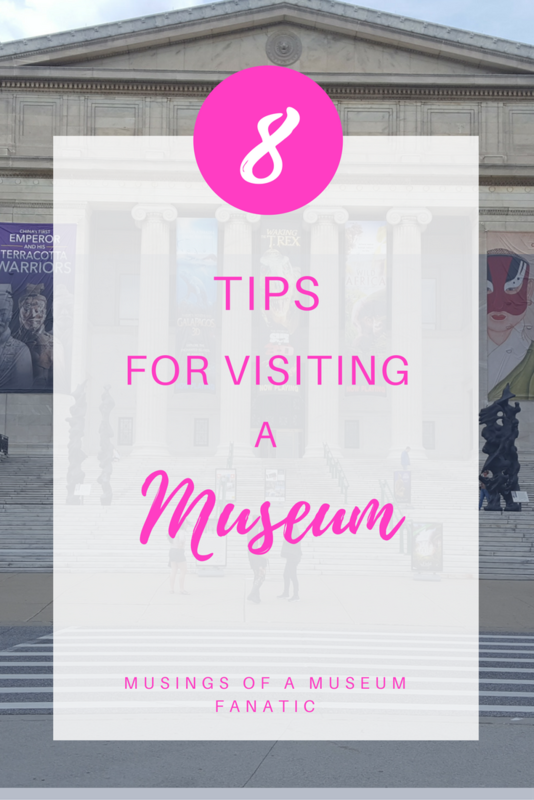 Whether it's making sure you're going on a free day or checking to see if the museum is actually open (seriously I've broken that rule and totally went when it wasn't open doh!) do a little research before you go. It will make your life so much easier. Maybe you find out through your research that this museum has something on exhibit that you would love to see you might have missed that by just going in without any previous planning and research. This is a biggie for me. As someone who most of her duties revolve around museum collection work I can't stress this enough. If a museum has this policy there is a reason! I'm not gonna lie I've been to places where I wanted to take photos so bad so I can share them with you guys here but I couldn't. Sometimes it might be because flashes can damage the artifact or document or there may be something to do with copyright. Either way don't be a jerk, be respectful of the institution and their rules. Most museums, especially small ones, tend to have free tours. Definitely take advantage of those if you're able to. There are always gems that the guide shares that you won't learn just by walking through the exhibits on your own. Even if a tour costs extra a lot of times it is worth it. You should make some time to chat with the staff or docents. We LOVE talking about our museums and sharing stories. Like the tours this is a great way to learn more about the collection, an exhibit or the museum itself. Plus you'll probably learn some tidbits to share next time you visit and impress everyone! This one is important!! Let's be honest food is always the most important part. Check to see if your museum has food options before you go. If they do you should make a point to enjoy their offerings. This not only makes it easier so you don't have to leave the museum and come back. This also supports the institution and might be a wonderful part of your day. Like when we went to London we made to sure to get lunch at the cafe in the Victoria & Albert Museum which is the oldest museum cafe in the world! This is also a really important thing to remember, especially if you're visiting large or several museums in a day. Museum fatigue is definitely real and can totally ruin your experience if you're not careful. My biggest recommendation is knowing your own limits, I know that I can spend a couple hours wandering around a museum before it sets in but some people might only be able to go an hour. If you plan on enjoying museums all day make sure to plan in breaks and know where there are places to sit. Being a blogger this one tends to be easy for me but I think that everyone should be sharing their museum experiences. Through Facebook, Yelp, Instagram or even by word of mouth, it doesn't matter how you do it just do it!! I feel it's especially important for smaller museums since it's a way of helping to support them and let other people know how amazing they are! Do you have any good tips for when you visit museums?